The Bowen family, consisting of dad Eric (Sam Rockwell), mum Amy (Rosemarie DeWitt), teenage daughter Kendra and younger children Griffin and Madison, move into their new house after being forced to leave their old one due to monetary concerns. Soon after moving in, Griffin begins to notice abnormal events in the house, but his family dismiss them. One night, with their parents out, Kendra babysits her siblings, and during a sequence of paranormal events, Madison is dragged into her closet and taken to a dimension beyond physical space. 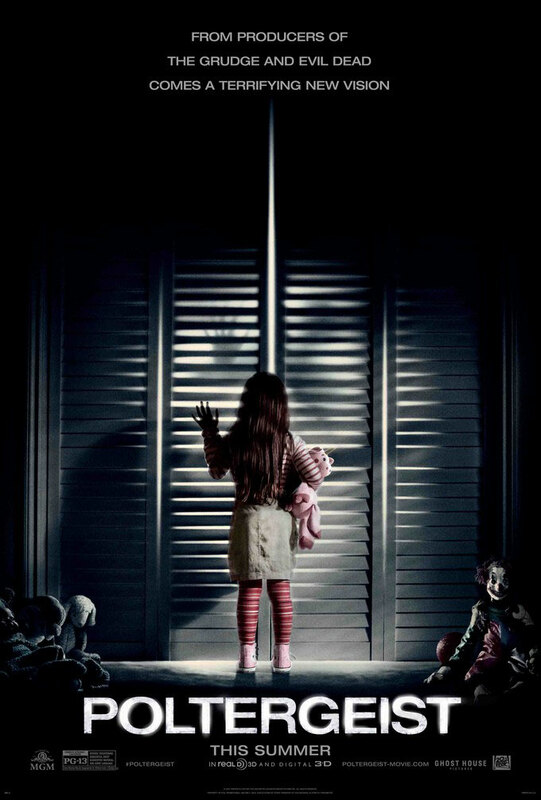 Having not seen the original Poltergeist film, I was free to enjoy this without any unneeded subjectivity and not need to worry about knowing where the story would go. Unfortunately this remake doesn't try very hard to be anything more than the bog standard horror that audiences are beginning to feel accustomed to now. Despite having a rather impressive list of names behind the camera, almost everything that ends up on screen feels tame, uninspired and, ultimately, lazy. Whilst it supposedly makes the effort to shake up the plot from the original in order to stand on its own two feet, the plot becomes so relentlessly predictable that it's hard to care about anything that the film offers us. One of the most disappointing elements of Poltergeist is its general lack of scares. Whilst it offers occasional moments that are genuinely unsettling, the film is entirely forgettable and fails to leave any lasting impression, nor any desire for a second viewing, due to the fact that it only really offers timid jump scares rather than any genuine horror. This lack of memorability is only worsened by the fact that Poltergeist's script is one of the weakest I've seen in the horror genre for a long time. The characters are all painfully two-dimensional, and bound entirely by cliches. Having a film that focuses on young actors is always difficult, but when the script is solid, potentially weak acting becomes passable. But these kids have nothing real to play with, and therefore ultimately fail to remain interesting characters, bogged down by weak acting. Whilst Rockwell does his best in the role he's given, the same can't be said for Jared Harris, whose paranormal investigator role is offensively thin, and so blandly acted that the titular poltergeist probably wouldn't want to take him anyway. Poltergeist also suffers from severe pacing issues. The central aim of the haunted house sub-genre is to make the viewer feel welcome in the house, to make us feel like we belong there and want to spend time there, before wrecking havoc and destroying our emotional connection to the home and the family. 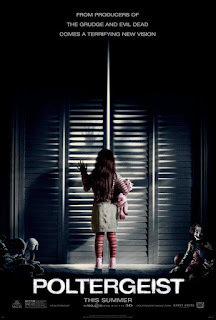 With this remake, the poltergeist activity begins almost immediately after we first enter the house, giving us no emotional connection to either the family or the home. This is why the original Paranormal Activity worked so well; we were slowly and calmly introduced to the home and the couple, before it was all horribly taken away from us. Poltergeist fails to set up anything of interest, resulting in a film that, when it comes down to the annoyingly tension-free final act, fails to create any emotional response in the viewer. The previous 70 minutes all go to waste once the film goes haywire, and it all counts for nothing. What makes this so frustrating, though, is that Poltergeist offers occasional flashes of good horror throughout, just spaced with about 20 minutes of bad film-making in between. The hands pressed against the inside of the television set was successfully unnerving, and the film is strengthened by arguably the best visual effects of any horror film since Cabin in the Woods. Whilst Poltergeist works well visually (there are some nice moving camera shots, too, and occasional bursts of smart cinematography), it tends to fall flat on every other level. It isn't frightening, the characters are about as two dimensional as they come, the script relies far too heavily on cliches and the sketchy pacing makes it difficult to care about what will happen next. Poltergeist could've been something quite special, and occasionally it heads in the right direction, only before sending the film back to fall in with the rest of the horror genre that both fails to offer anything new and feels, ultimately, like a waste of time. To Summarise: Whilst it works visually and offers occasional flashes of solid horror, Poltergeist ultimately fails to leave a lasting impression due to its tepid script, relentless cliches and an over reliance on poorly executed jump scares.